Inno Pocket, an Asian based mobile accessory company, is looking to upgrade the Smart Cover with their own version called the Tank. It is an aluminum constructed, anti-shock case that is designed to protect your iPad in its entirety. The case is made with two aluminum shells using an ABS clasp that allows you to rotate the top shell in a 360 degree motion. The bottom shell is designed to fit snuggly with your iPad and has an ultra-thin polymeric lining to keep it from scratching the metal surface. Similar to the Smartcover, the Tank can form into four different positions allowing for easy reading, writing, watching, and video calling. The Tank is available now for $99.99. We've got yet another incredibly interesting capacitive stylus straight out of Kickstarter that targets Adonit's Jot stylus in hopes of shooting it down with its missile looks. The Zeppelin stylus is made out of machined solid aluminum with a contoured body shape, but its secrete isn't the missile style cap that serves as the Zeppelin's protective tip cap, but also as a visually appealing rocket stand. The tip is made out of a coiled teflon coated tempered stainless steel with a sprint base that allows for multiple writing angles and eliminates any clicking and tapping noise on the iPad's glass touchscreen, unlike the Jot's plastic disk that makes a quite audible tapping sound we've discovered while reviewing it. The Zeppelin's stainless steel coiled tip is said to offer an ever clearer, unobstructed view for more precision over the Jot's clear plastic disk and ball point tip. 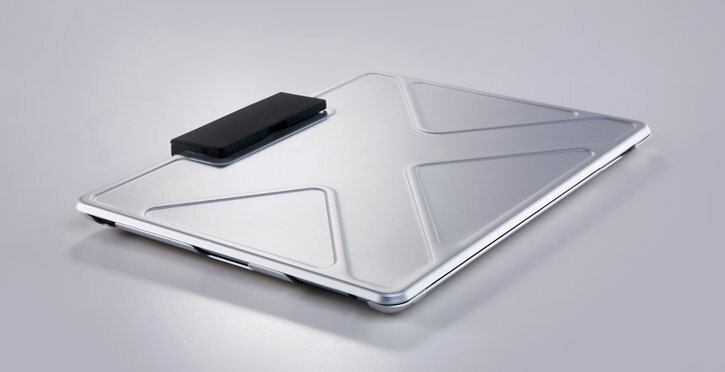 Built-in magnets allow the Zeppelin to magnetically cling onto the iPad 2's bezel. In any case, the Zeppelin is available to pre-order for $25 and should retail for $59 once the Kickstarter funding is successful. Thanks for the tip, Ken! 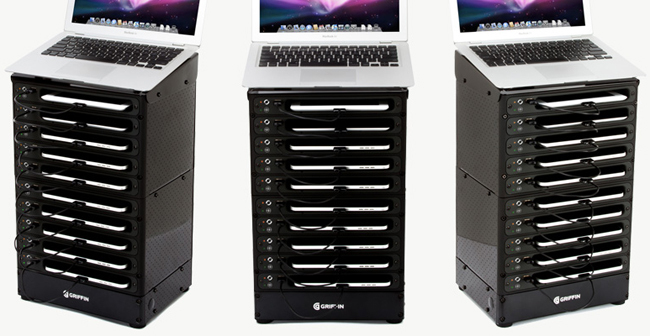 Griffin's new MultiDock lets businesses and education institutions safely store and charge multiple iPads up to 10 at the same time in the most convenient way possible. Each charging bay can accommodate any iPad and iPad 2 with cases as bulky as Griffin's own Survivor case and are set up in a server-like fashion with charge and sync LED indicator lights. The MultiDock charging station can be daisy chained up to 3 MultiDocks via an included USB hub. Griffin's MultiDock is now available for $700 a pop. NuForce has released a new amp called the Icon iDo that promises to improve your iPod, iPad and iPhone's compressed audio quality to CD quality sound by bypassing Apple's own built-in DAC (digital-to-analog-converter) by connecting to your Dock Connector port via USB to deliver audiophile grade audio playback with low-jitter. All that sounds great until you find out that you need to plug the Icon iDo to an external power supply to power it up. Not so portable now is it? But with that extra power, the Icon iDo amp can power up those juice-hungry headphones of yours without a sweat. It can also be plugged into your home stereo system with its RCA and digital Coaxial outputs. NuForce's Icon iDo amp features an LED volume indicator gauge on the front with a smooth volume knob and an aluminum enclosure. Available in 4 colors for $249. Logitech's latest gaming accessory is called the Joystick, and it's a springy plastic thumb stick with a few suction cups that you stick to your iPad's screen to give you better control while gaming. Looks familiar doesn't it? That's because Logitech has essentially taken Ten One Design's popular Fling and renamed it as if it were its own. Logitech has been on a shopping spree as of late. Going after products it thinks it can put its name on and sale like Zagg's Keyboard Case for the iPad and Samsung Galaxy Tab 10.1. Only this time Logitech hasn't even mentioned its partnership with Ten One Design. At least Logitech's Joystick will run you a bit less at just $19.99 a pop instead of purchasing two Flings for $29.95. After the success of Ten One Design's Pogo Stylus, the company has recently launched a new stylus designed to work with the iPad and iPad 2 with an aluminum unibody design for a solid and balanced build. 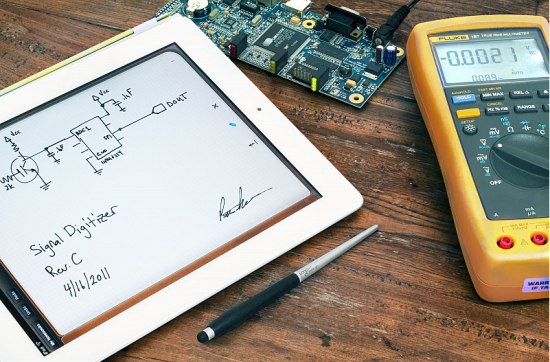 The Pogo Sketch Pro is most likely the longest stylus ever made that looks like an artist's paint brush. The Pogo Sketch Pro stylus features an ergonomic rubber grip and a patent pending, pattern structures in the Pogo Sketch Pro's rubber tip that is said to be sensitive enough to be effective in virtually any angle while being able to smoothly glide across a touch screen. It also comes with replaceable tips and is available now for $24.95. A bored iPad user decided to make his spare time a little more useful and built his very own Lego stand complete with an electric motor that can adjust the viewing angle by a press of a button. How useful is that? Some would even call it the best stand for the lazy bunch. If you geeky Lego fans must know, the stand was built using a 8052 Lego container truck set. Video after the break!